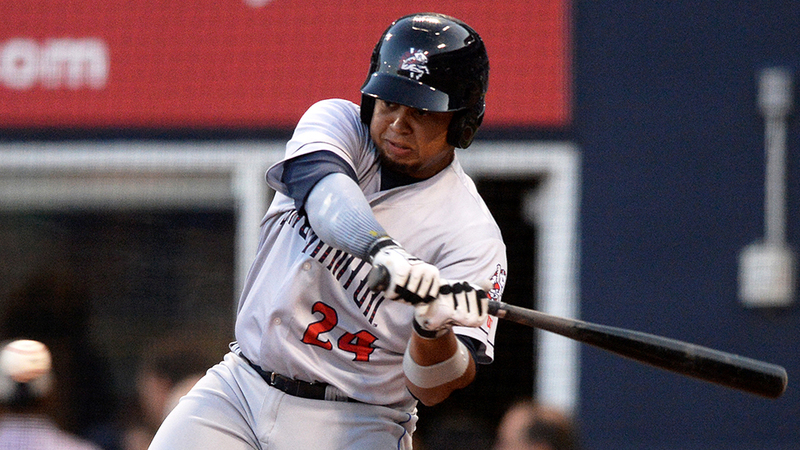 Through his first four at-bats Monday night, Jhoan Urena drove in more runs than he had in his previous 18 games. He set a career high and a Double-A Rumble Ponies record in the process. The Mets' outfield prospect slugged a grand slam in the first inning, a solo homer in the third and a second slam in the sixth for nine RBIs as Double-A Binghamton rolled past Hartford, 12-2, at Dunkin Donuts Park. Urena, who went yard twice Friday, eclipsed the club record of eight RBIs set by Jorge Toca on June 25, 1999. He smashed his personal best of five RBIs, which he accomplished with Class A Advanced St. Lucie on June 29, 2016. "I feel good and I keep working hard," Urena said. "I knew that third home run was another grand slam, so it was a great feeling. I was really happy." The Dominican Republic native kicked off the scoring by ripping his first grand slam over the center-field fence off Hartford starter Frank Duncan in the first inning. He took the right-hander out to center again in the third for a solo shot and was retired for the first time on a flyout to left in the fifth. The switch-hitting Urena completed the trifecta with his second slam, this one to left batting right-handed, off reliever Brian Moran in the sixth. He went down swinging in the eighth, finishing up with his eighth game of three or more hits this season. "I had three home runs, so I was trying to hit a fourth, but it just didn't happen," Urena said. "I thank God I played a good game today." It was the first three-homer game by a Binghamton player since three-time National League All-Star Daniel Murphy accomplished the feat on May 26, 2008. It marked the 21st three-homer game in the Minors this season and the second in the Eastern League. Jake Rogers, Detroit's No. 11 prospect, went deep three times for Erie on June 18. "It was a lot of fun, especially with my teammates," Urena said. "They were all so happy for me, but that's the way they always are. Whether it's good or bad, my teammates are there for me. They're a great group." The 23-year-old, who hit .221 with four homers and 17 RBIs in 50 games across June and July, has cleared the fences five times in his last four contests. He's batting .286/.378/.586 with six roundtrippers and 19 RBIs in 22 games this month to push his overall slash line to .252/.317/.410. His 13 home runs are one shy of the career best he set last season between Triple-A Las Vegas and St. Lucie. "I've been working on a few different things, but I'm always focused on my main goals," Urena said. "I'm giving my best out on the field and lately it's been working for me." Top Mets prospect Andres Gimenez chipped in three hits and an RBI while Joey Terdoslavich singled twice and drove in two runs. Starter Mickey Jannis (10-6) allowed three hits and four walks in six shutout innings. The right-hander struck out five during his second scoreless effort in three starts. Drew Weeks hit a two-run homer to account for Hartford's offense. Duncan (2-4) surrendered a career-high 10 runs on 10 hits and two walks with three strikeouts in 5 1/3 innings.